From the makers of Mercato Centrale, Midnight Mercato, The Ultimate Taste Test and Soderno at Molito comes another great adventure of delightful foods, great treats and a unique lifestyle festival like no other. Catering to the regular weekday crowds, Distrito is open every Wednesday to Friday from 9PM to 3AM, right smack in the middle of Makati. The Amorsolo open car park of Makati Medical Hospital will be our feasting grounds. Feast on great food finds, fashion finds, health and wellness regimes for your healthy lifestyle. 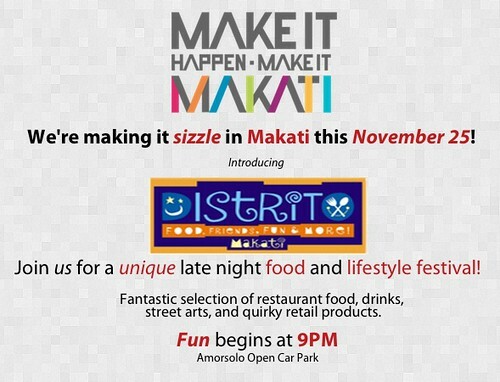 Be there at Distrito opens its doors starting this Friday, Nov. 25, 2011 at 9PM. See you there! For more information, please visit Facebook.com/DistritoMakati or follow us @DistritoMakati.